There is plenty to do and tomorrow is another day as they say. So, I will rest and let my mind wander through my thoughts. I work much better with a clear mind and a rested body. I don’t work like I once did, but I’m not used up yet! I got up this morning and had an idea. I would plant oats in my spent corn field. I am not trying to get a grain crop. 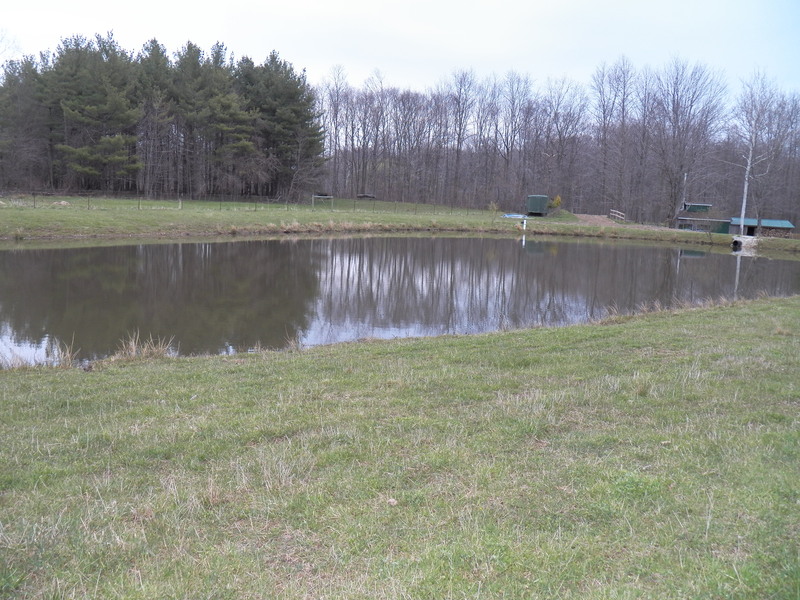 I just want to plant a quick crop of additional pasture. It should be ready by mid June. I may only get a week or two grazing from this field, but I used my bin oats to plant it, at a cost of about twenty five dollars, plus some diesel fuel. I can’t feed ten cows for two weeks much cheaper than that. So I say hooray for oats! The awesome grazing extender! I hope to start back on my firewood cutting for the sugarhouse next week. If I push hard, I should have the woodshed filled before time to cut hay! Now with the oats out of the way, the only other big farm job is to empty the compost bin. That too will be a big job, but I can do it in one long day. The sun stays out until after nine pm. It gets up early these days too. All I have to do is work with old Mr. Sol, and my work will disappear …. now, talk about a beautiful day! This garden space was once used completely. Now, there are not so many of us, so the whole space is not needed. I arranged these raised beds to be able to mow in between and around the ends. I can drive down through the garden to hoe, harvest or add compost when needed. The added height will dry us out sooner and make our wet, cold springs less of a concern. It will also be easy to root zone water when needed. I like the new look. I am sure that I can raised plenty of food for the two of us. 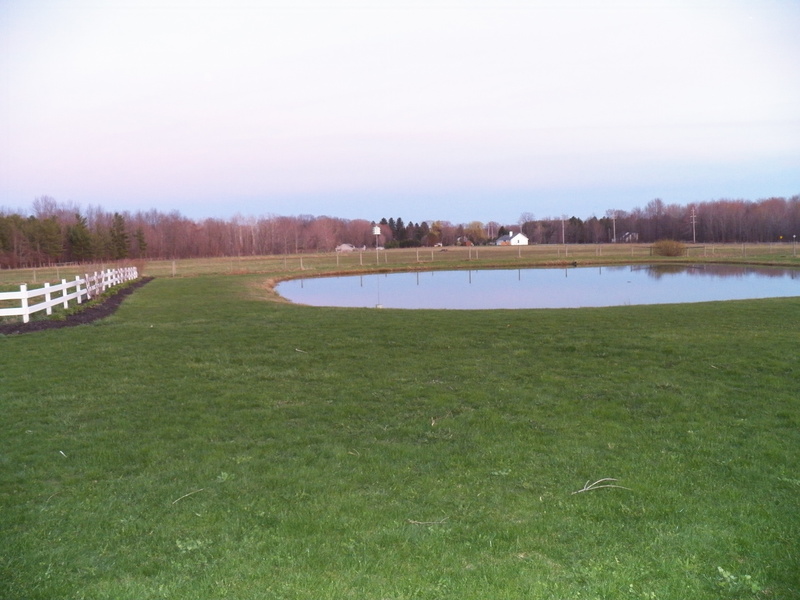 The one side of the garden I left so it can be plowed and used for things like potatoes and sweet corn. Who knows ? I may one day only use the raised bed system and add more. This season will be our first with this set up. We do have two raised beds of strawberries. Those beds are thirty inches high, so no bending over to pick berries. I hope this makes for easy gardening as I age 😮 I used to focus so hard on gardening that I almost took the fun out of it. I hate weeds and enjoy a clean, neat garden. I have enough to do without obsessing over a few weeds. I hope that I can stay just as focused, but in these smaller spaces, spend far less time hoeing. I think this will be fun. 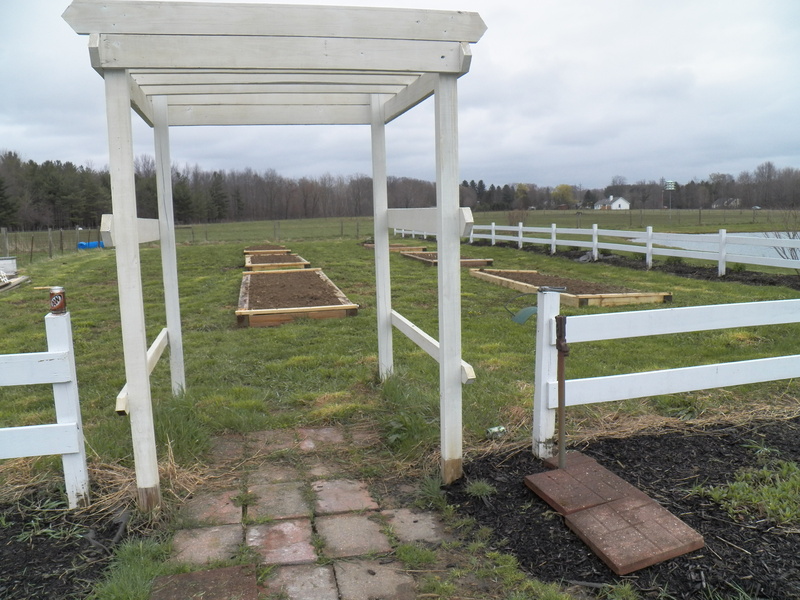 I am considering small high tunnels to be used in conjunction with the raised beds. This will extend my gardening season on both ends. I think by having soaker hose to water when needed, along with the warmer soil, I can continue to raise award-winning produce, but with half the effort! I also plan to create beds for a blueberry patch, some herbs, asparagus, and some thornless blackberry bushes. In short, I’m just going to have fun with this space. The best part of this project is that more than two thirds of the material was left over from other jobs or salvaged. The dirt was left over from the building of my son’s house. 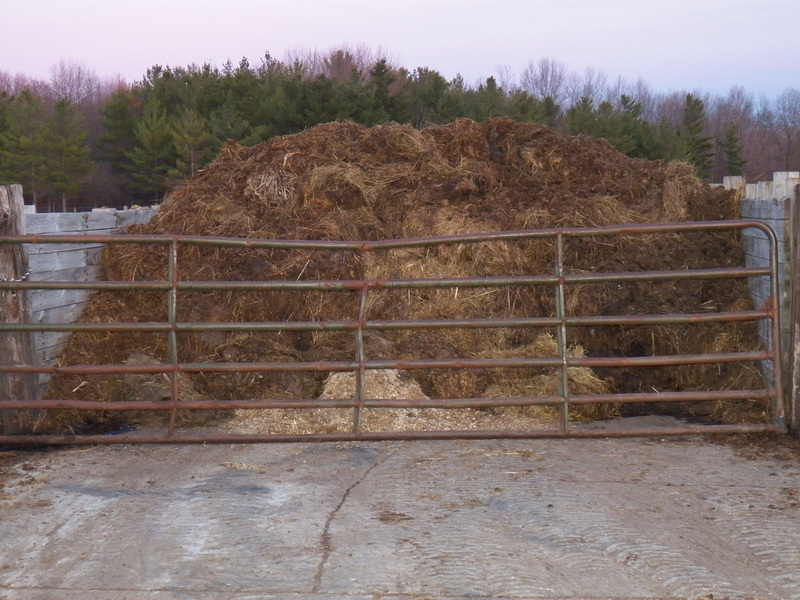 Compost will be applied and mixed in once we clean the manure storage area this spring. I want the very best stuff for these beds. I like it when you plant seeds then have to step back quickly, so the growing plants don’t knock your hat off ! Last Friday my bee packages arrived. I of course was not ready 😮 Oh well, I dropped almost everything else and scrambled to get my new Top Bar bee hives ready. 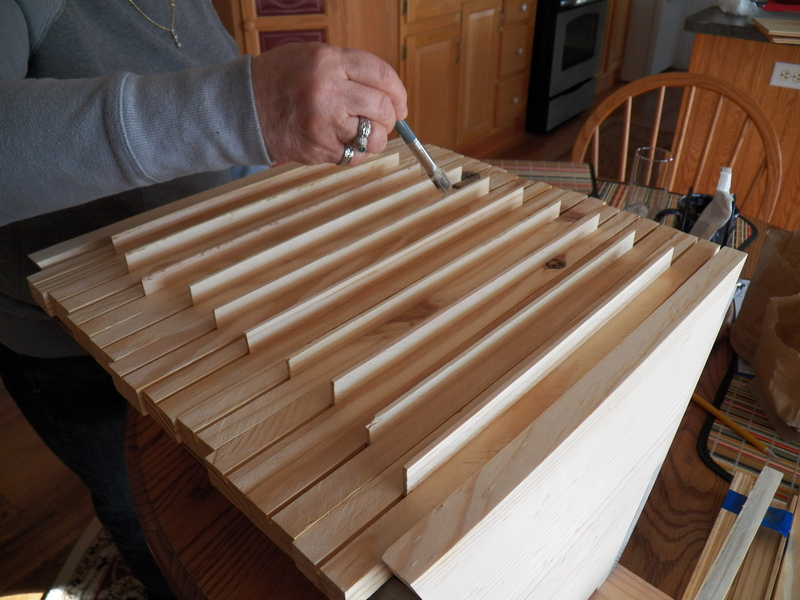 I want to try these old/new hive bodies for raising bees on the homestead. I sold or gave away most of my equipment that revolved around the traditional Langstroth style of boxes and frames. 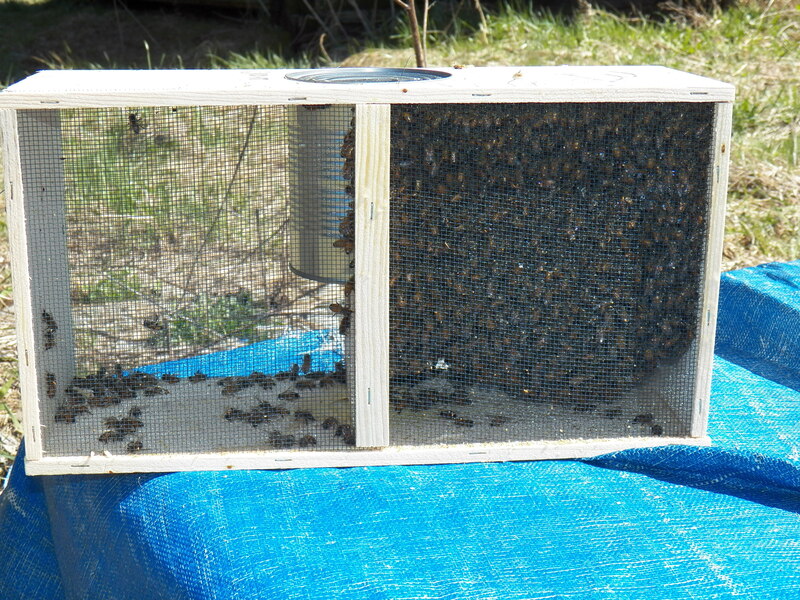 I just got tired of losing bees, maintaining equipment and storing stuff to keep wax moths out etc. I guess it was part of my trying to downsize some of my work…problem is… I miss having the bees here. I ordered two Top Bar hives. My plan was to hive them with purchased bees. 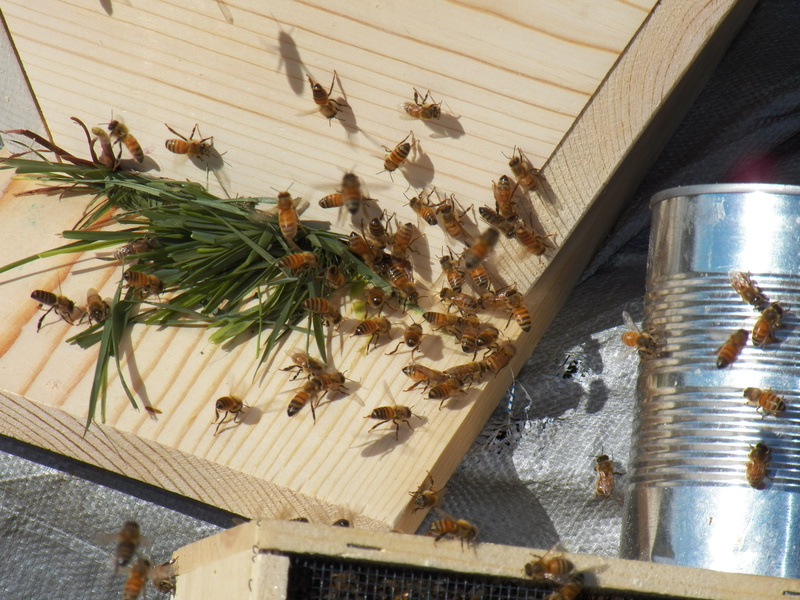 New bees, new woodware, new plan, everything should be great…right? Wrong! I forgot to get my hives put together until I got the call saying my bees are here! Thank goodness my wife helped me prepare. She helped with assembly and she painted the beeswax on the frames. The beeswax guides the ladies where to build their comb. We got the hives all built last Friday night. Other folks go out to dinner or a movie on Friday nights. We spent ours screwing……hive boxes together 😮 Once the were completed, all I had to do was get the bees put inside. I have handled many wild swarms, but this was my first experience with purchased bees. I give many thanks for the folks at YouTube. I spent some time watching and learning! I placed the hives in a good location, sprayed the inside with sugar water, placed food in there and then prepared the bees for placement. On YouTube, nobody wore their bee suits…I sure as heck did. I am not afraid of the occasional sting, but I also know the kind of pandemonium that can ensue when working bees. Much better to be dressed and prepared than running like a madman for your veil. I followed the instructions laid out in YouTube and it worked great! I twisted some grass and installed it at the hive entrance to reduce the opening size. I will remove it later, once the hive has built up and can defend itself from intruders. I dumped the bees into the hive after hanging the queen inside in her cage. The bees will remove candy cork that holds her inside. Then the work begins as the queen sets up housekeeping. I placed the bees, installed the food then put the lid on the hives…yes, hives, I ordered two packages of bees! I waited outside the hives watching the new neighbors acclimate themselves to the neighborhood. As I left the bee yard, only about 1000 bees were in flight around the two hives. I am hoping all is well. I will check them on a sunny day next week. 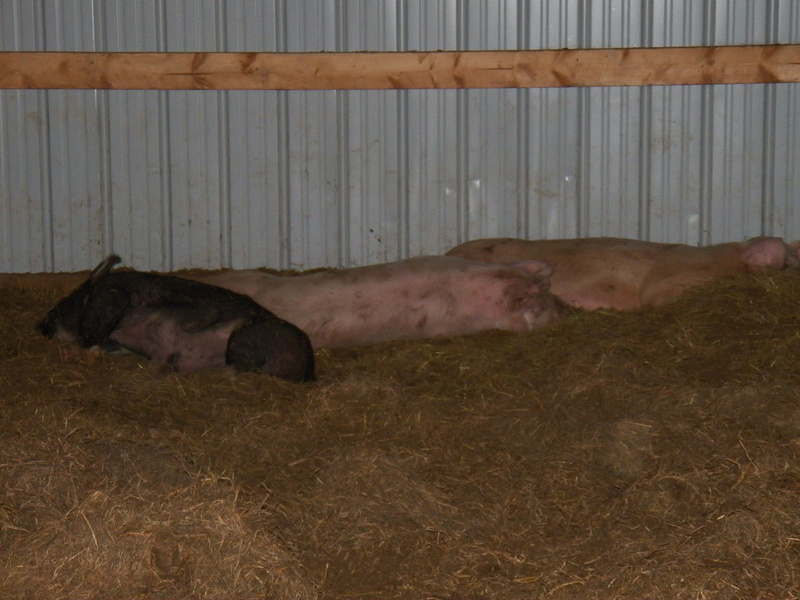 In the meantime they will settle down and settle in. Welcome home ladies! Top Bar hives are not new. They have been used around the world for centuries. They allow the bees to draw honeycomb just as they would do in the wild. They make their bee cells the correct size for their larva, not larger ones like commercial hives do. 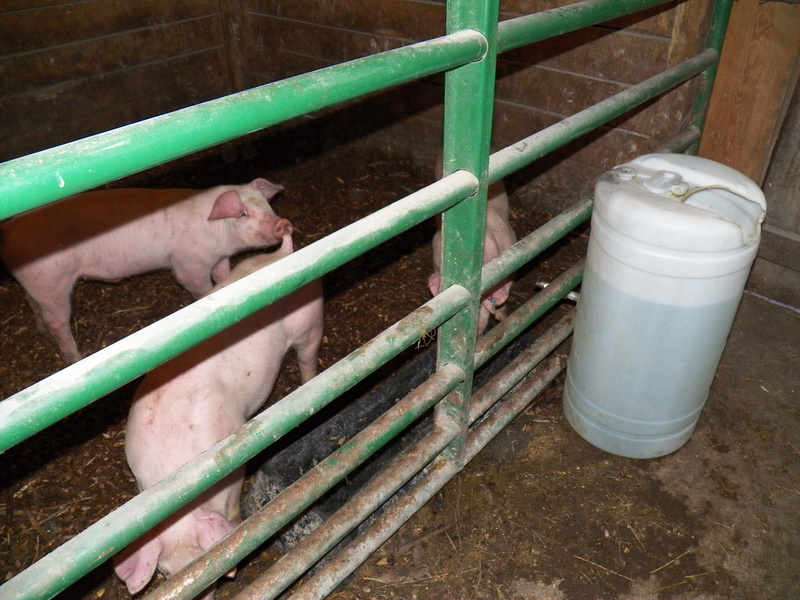 The larger cells allow for Varoa mite infestation and other problems. Once the bees draw out comb and fill it with capped honey, all I have to do is slice it off and strain it. It is easy. It is natural and it is as good for the bees as it is for a busy farmer. A Pig or a mouse..Come on Squeak Up! The spring green up continues. It is just nice to sit and look at the landscape. Soon bugs will be out, grass will be needing mowed and it will be hot. I like spring and fall. Both sides of summer are loaded with beautiful color and adventure. The flowers at both times of the year punctuate the scene with their beauty. Our project list is looking manageable. 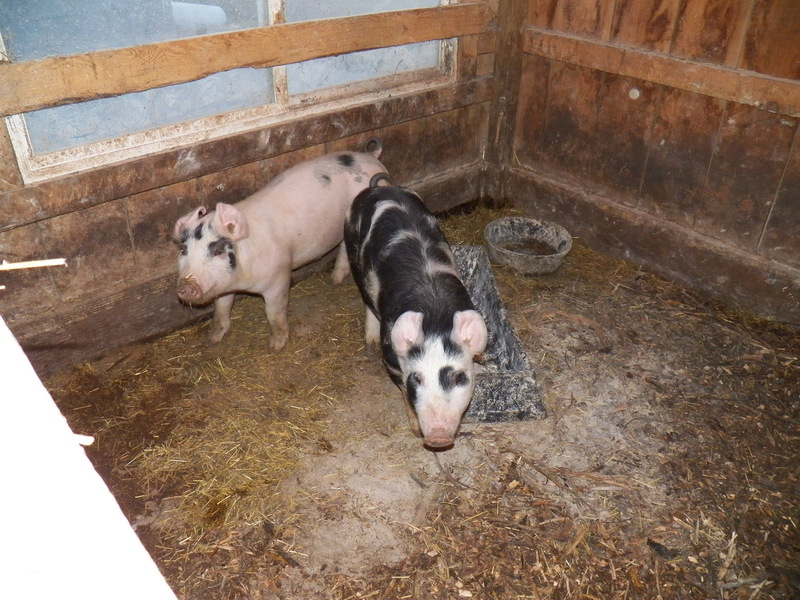 I have plenty of things to keep me busy, but looking at piglets, green grass and the first flowers of spring are at the top of my list right now. I will give myself permission to reflect on old friends, look for the beauty in the little things and celebrate the cycle of life. We spent the weekend working on projects from a big list my wife and I made. It included such things as washing the house, picking up “stuff” from the yard our dog Max finds and carries there. 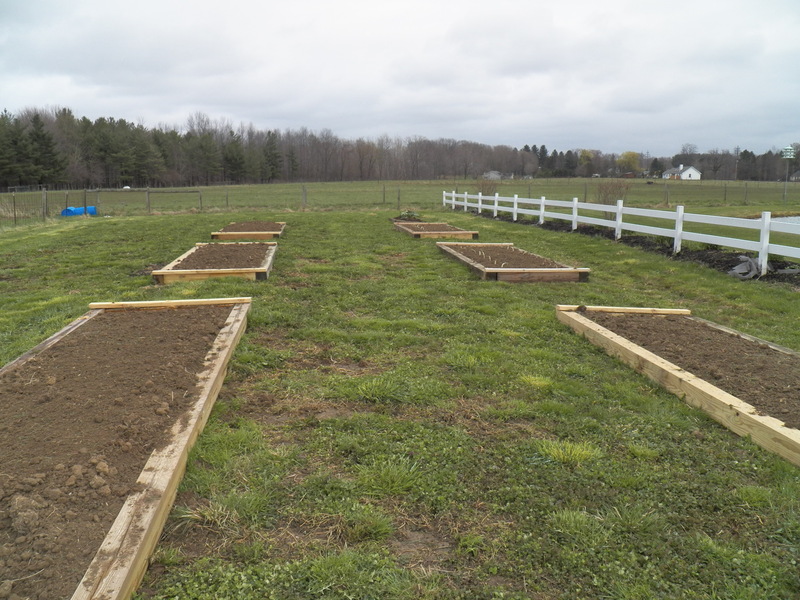 We built some raised beds in preparation for the gardening season. We got the flower beds ready for mulch and restored order to several trivial, yet annoying things. One good thing, having paused with farm work to do the little things keeps smiles on faces as the spring planting season bears down on us. A large pile of firewood is waiting to be cut and split. I want that job done and over before it’s time to cut hay. Farm work keeps a guy busy, but he must set enough time aside for the things that are important to his wife. It pays to remember those little things!